EL MONTE >> Police in El Monte shot and killed a man as he allegedly charged at officers with an SUV late Friday, authorities said. 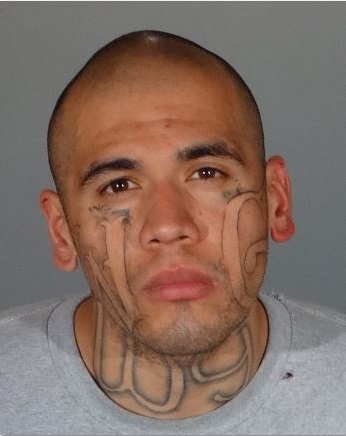 The incident took place about 9:35 p.m. at Esto Avenue and Fieldcrest Street, Los Angeles County sheriff’s officials said in a written statement. Detectives from the sheriff’s Homicide Bureau are handling the investigation into the officer-involved shooting. The identity of the suspect was not released Saturday pending notification of his family, Los Angeles County Department of Medical Examiner-Coroner Capt. John Kades said. Prior to the shooting, El Monte tried to pull over a mid-size SUV near Valley Boulevard and Tyler Avenue, suspecting that the driver was intoxicated, according to Deputy Trina Schrader of the sheriff’s Information Bureau. The driver refused to stop, starting a pursuit. The suspect crashed into another motorist during the chase and continued fleeing, she said. The driver of the car struck by the suspect was not hurt. Police continued chasing the SUV until it came to a stop at the intersection of Esto Avenue and Fieldcrest Street, Schrader said. Officers got out of their cars and approached the suspect. Paramedics pronounced the wounded suspect dead at the scene. Three officers fired their weapons in the incident, officials said. No officers were injured. Another El Monte officer collided with a civilian car while responding to the pursuit. The driver of that car was treated for injuries described by officials as minor. Anyone with information was urged to contact the sheriff’s Homicide Bureau at 323-890-5500. Tips may also be submitted anonymously to L.A. Regional Crime Stoppers at 800-222-8477. SOUTH PASADENA >> Police shot and wounded a suspect in the middle of a home burglary as two women who lived in the house hid in an upstairs bathroom early Saturday, authorities said. The incident began about 4:25 a.m. when a 48-year-old woman and her 22-year-old daughter realized there was an intruder in their house in the 1300 block of Huntington Drive, Los Angeles County sheriff’s officials said in a written statement. Officers rushed to the home and made their way inside, officials said. It was unclear what prompted police to open fire on the suspect, or whether he was armed at the time. Police cordoned off the home and used a ladder to rescue the women through the window of the bathroom in which they’d been hiding. 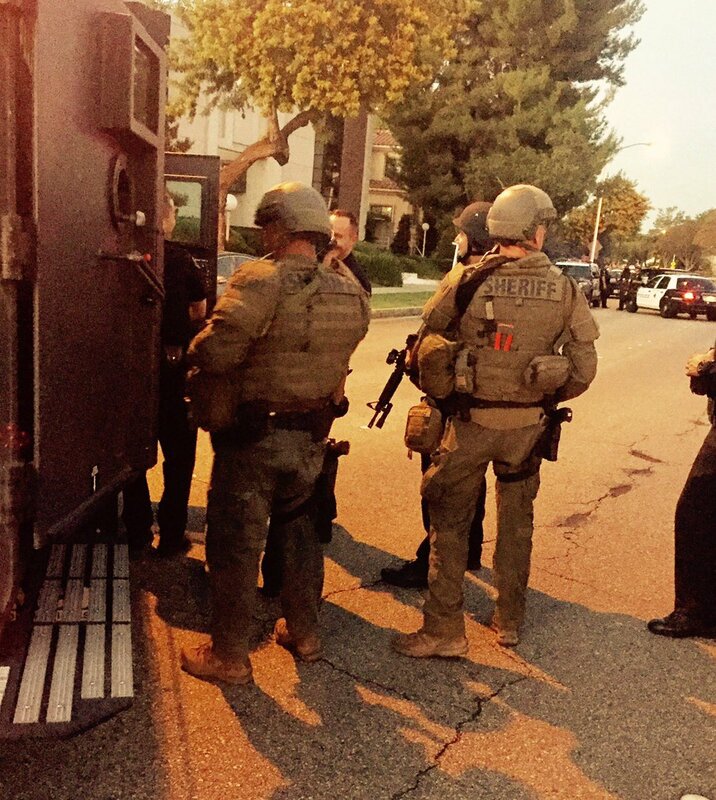 A sheriff’s SWAT team responded to deal with the barricaded suspect. Officials from the sheriff’s Special Enforcement Bureau announced the suspect was in custody about 7 a.m.
“While in custody, it was discovered that the suspect had been struck in the shoulder by gunfire,” according to the sheriff’s department statement. 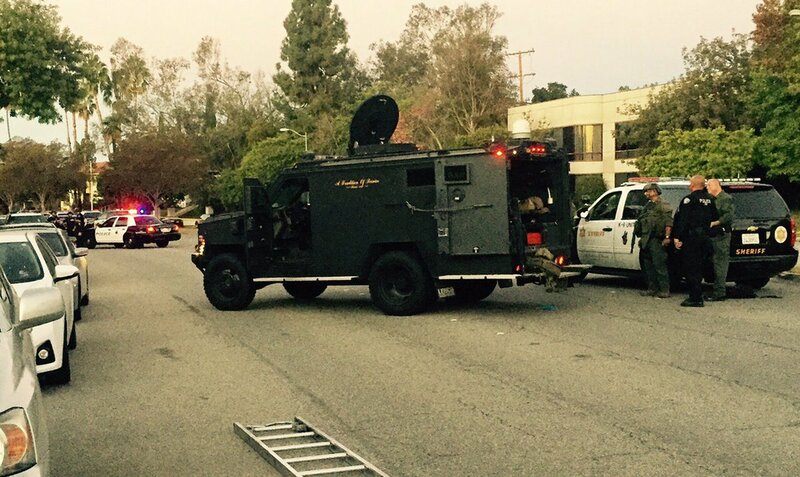 The 48-year-old suspect was treated at hospital before being booked on suspicion of burglary. His name was not released Sunday. South Pasadena police deferred comment to sheriff’s officials, who traditionally investigate officer-involved shootings involving Los Angeles County police agencies. The residents of the home were unharmed, and no police officials were injured during the incident, sheriff’s officials said.